When you want the right small car, you deserve one with an emphasis on spaciousness. That’s the 2018 Kia Soul. There’s more room for you, your passengers, and cargo. Comparing it to the 2018 Honda Fit, you’ll find that the Soul offers a better package of amenities and benefits. If you like to drive, you’ll appreciate that you have more choices with more horsepower when you choose the 2018 Kia Soul. The standard is a 130-horsepower engine, similar to the Fit’s one and only engine. Both have a manual edition. Beyond that, Fit hatchbacks have a continuously variable transmission while Soul hatchbacks have a much more familiar six-speed automatic. There is no other choice for the Fit driver, but the Soul shopper has some fun choices. An inline four engine churns out 164 horsepower. Given the car’s lightweight build, this is quite speedy. If you want something much faster, then you can enjoy a 201-horsepower engine. This turbo-four is matched to a seven-speed dual-clutch transmission. The Soul’s creative shape offers more than eye candy. It has a taller, more spacious cabin than the Fit and similar rivals. Kia models have 101 cu.ft. in the passenger cabin while Honda’s make do with 93 cu.ft. The front seats have longer seat cushions for greater support. Headroom and legroom are good for this class. In fact, the height of the seats is better than those in other economy cars, such as the Fit, and that makes it easier to enter or exit the Soul. Interior materials are both handsome and practical. By comparison, the Fit seems full of harder plastics. The basic Soul package also has a few things you won’t find in the Honda. This includes dual illuminated vanity mirror s and overhead storage. Higher editions of the Soul offer a panoramic sunroof, which is unavailable on the Fit. As for utility, you’ll find two more cubes in the Kia hold (18.8 cu.ft.) than the Honda (16.6 cu.ft.). Both cars are offering crash avoidance features. This includes a frontal collision system with an autobrake, a lane watch with an assist, and adaptive cruise control. Kias are offering some things that Honda isn’t. The automaker lets you add a blind spot system. This includes the important rear-traffic alert. You can never talk about a Kia without mentioning the peace of mind that comes with its long warranties. While the Fit is covered by a three-year limited warranty, the Soul warranty runs for up to five years. The Fit powertrain warranty is five years, but the Soul warranty runs for up to ten years. Kia is willing to help its shoppers stay on the road longer and with fewer fears. That’s a good reason to put the Kia Soul at the top of your shopping list. 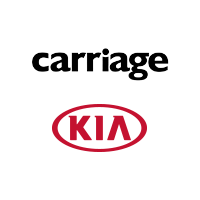 Visit us today to a test drive now at Carriage, your Woodstock Kia dealer. * MPG: Based on EPA estimates. Actual mileage will vary with options, driving conditions, driving habits and your vehicle’s condition.